Summer is coming – it must be time to bring out the Lollies! Our fabulous and esteemed judges have chosen the shortlist but we want YOU, and your children and your classes, to choose the winners. This year we have made it even easier for teachers to involve their whole class by giving each teacher 32 votes! We want to make sure that it is easy for you as teachers and parents to get excited by excellent, and especially funny, writing, writers and illustrators. Are you teaching the next Shakespeare or Rowling, or the next Walliams or Rosen? We love all literature – from picture books to Tolstoy – and can easily recommend a million books of all styles. When we talk about books that make us laugh, though, it can bring a smile to our lips just remembering a title, or a front cover, or one line. That one paragraph finished with an unexpected comedy twist that made us snort embarrassingly on a packed bus on the way to school or our daily work commute. We have, often preconceived, ideas of what constitutes “serious” reading and what is “just for fun” – yet some of the funniest books can make us think the hardest, and some of the blandest subjects can make us guffaw until tears fall down our cheeks. The Lollies celebrate the sublime to the ridiculous and everything in between. Books that make your toddler laugh on the potty and make teens crack a smile when trying to look cool and composed. Spend some time with our shortlist in the coming months and show your students that not everything needs to be serious to be successful. As Michael Rosen says “Humour, I think, brings us together.” We bond over the worst of cracker jokes and the best of stand-up comedy. A great book can bring all of that into our classroom. The Lollies help you to find the most appropriate, and best, of the latest material. Whether you just want to read aloud and enjoy the humour together at the end of a trying day, or want to get the whole school involved in activities and events, there are plenty of ways to introduce our amazing shortlist to pupils, parents, and staff in your community. On our website you can look out for resources and lesson packs to bring the Lollies into your classroom, and keep your eyes peeled for the sequel to this blog which will contain curriculum-linked ideas for every year group and also some whole school ideas to get everyone LOLLING this summer! We know budgets can be tight and would hate to think anyone misses out on such a fantastic range of heart-warming literature so you will also find lots of free extracts to use in school if you cannot afford to buy the actual texts. Laughter has no price tag! Jodie is an award winning ex-primary teacher who now works as a Freelance Edtech Consultant. Her interest in using technology in education has led to her working with a number of educational technology businesses since leaving the classroom. Most recently she has been Head of Education for an assessment system provider and has specialised in helping schools to transition to the new curriculum and leaving levels behind. 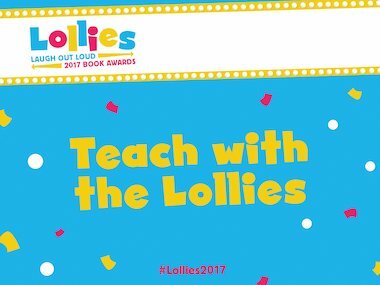 Ideas for every teacher with our Lollies shortlist! In her latest post for us, education expert Jodie Lopez shares her ideas for teaching the Laugh Out Loud Book Awards shortlist in the classroom.